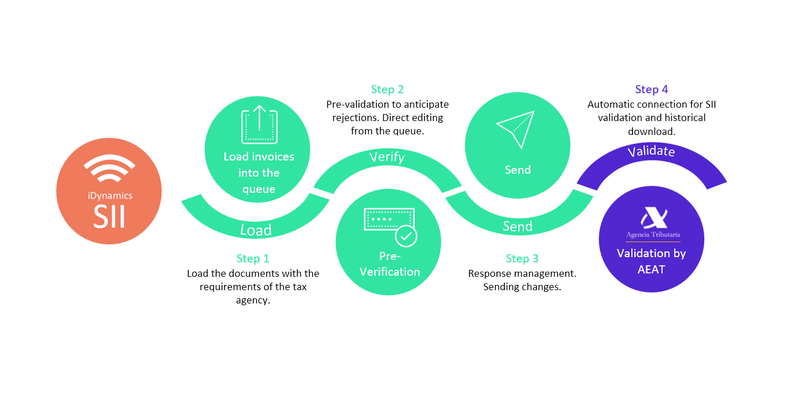 iDynamics SII, facilitates compliance with the obligation to submit VAT information to Spanish tax agencies (AEAT, Regional Treasury of Navarre, Basque Regional Treasury, Canary Islands Tax Agency (IGIC)) through the service of Immediate Supply of Information (SII), directly from Microsoft Dynamics 365 Business Central. It is intended for those customers who have requirements that are not covered by the standard functionality of Microsoft Dynamics 365 Business Central, who wish to consult the data stored by the tax agency (and its quad status) directly from the ERP, or who wish to take advantage of the personalization and shipment management facilities added to Dynamics 365 Business Central. These are the steps to be taken after iDynamics SII is installed for the first time. Once configured, it should not be necessary to return to this screen unless there are changes in the way to integrate with that system. Here are described the parts of the application that will be used habitually, to send data to the SII and to visualize the state of the communications with the system. Different examples of VAT setup. The objective is that they help to serve as a starting point for the setup of the clients. Since one of the things that cause most confusion is the different ways of identifying the counterpart on an invoice, we have created a small guide detailing what each one consists of. Are you thinking of installing iDynamics SII and still have doubts?, This document lists some of the main features that highlight the product of Microsoft's standard solution.